This article is about the place. For the quest, see Kolskeggr Mine (quest). Kolskeggr Mine is a gold mine east-northeast of Markarth. The mine is directly south of the Lover Stone, and contains by far the most gold ore veins in one location. It was overrun by Forsworn and the miners fled to Left Hand Mine, where you can get a quest to free the mine when talking to Skaggi Scar-Face. Pavo Attius will buy gold ore from you. Kolskeggr Mine: Clear the Forsworn from Kolskeggr Mine. 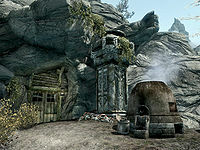 The path to the entrance is up a dirt track starting just before you reach Pavo's house coming from Markarth and passing under an arch just before the entrance. There are three Forsworn stationed near the entrance, one by the entrance and the other two next to Pavo's house, once the quest has been completed you can also find a Markarth guard by the arch, who may fight the Forsworn on your next visit. There is a smelter, two fly amanita growing to the right of the entrance and a hanging moss growing from the tree. Upon entering there is a ramp leading down into the mine. You will pass various carts, barrels and crates. As the tunnel bears to the west you will see a crossroads in front of you. There is a Forsworn patrolling, north-south across your path. Dealing with them is likely to alert most of the occupants of the mine including the boss. Up to two, including the boss will come from the right hand tunnel (north) and a further two from the tunnel ahead (west). This can make it a difficult fight as they are all leveled and will attack with a combination of melee, magic, and bows. The southern tunnel is a dead end with a gold ore vein. The northern tunnel leads past a barrel with an iron dagger and garnet on to a further three gold ore veins; there is a hole in the ceiling that can be used as a shortcut from deeper in the mine back to the exit. Back at the crossroads and taking the tunnel to the west, the tunnel turns to the north as you pass more barrels, crates, sacks, a knapsack, a rack with a pheasant hanging from it and a bottle of alto wine. Continuing along the tunnel, it opens out into a well lit cavern with a wooden structure in front of you. If you have remained undetected you will find two Forsworn patrolling or mining—one by the wooden structure and one below the structure. Next to the ramp up are two large shelving units—the first contains a potion of strength and a leveled stamina potion and the second contains a knapsack. To the right of these are some more barrels, sacks and crates one of which has a bottle of alto wine on top. Further along beside the structure is a cart with a canvas roof containing an open crate containing two gold ingots. Around this part of the cavern are a total of five gold ore veins. Returning to the start of the wooden structure and following it up and to the east, you will pass a turning on your left (north) leading to a dead end containing two gold ore veins. Just past this is a gold ore vein on the north wall. Follow the path to the east to another Forsworn-patrolled junction; straight ahead leads to two more gold ore veins at another dead end and a turning south leads upwards to two gold ore veins on your left. Turning west you will pass a table containing two gold ingots, a loose gold coin and three gold ore samples. On your right immediately after the table is the seventeenth and final gold ore vein. This is where the boss, a Forsworn Briarheart, will patrol. Just past this is the hole previously mentioned that can be used as a shortcut back to the exit. This is the only active gold mine in Skyrim. It also contains more than four times the amount of gold ore veins than any other single location, at seventeen. After completing the quest, the Forsworn respawn, attacking and often killing the miners who return to work after the quest. This page was last modified on 20 March 2017, at 06:13.